We are delighted to announce that we have received support from the Heritage Lottery Fund for a year-long project which will celebrate Dumfries’ stonecarving heritage! Our new project is underway to help people discover the amazing history and continuing tradition of stonecarving in Dumfries. From local quarries at Locharbriggs, to ornate stonework and gargoyles high above the shopfronts, the town has a fascinating stonecarving story to tell. The project is led by the Dumfries Historic Buildings Trust and funded by the Heritage Lottery Fund, Holywood Trust, and the People’s Project. A series of events will begin in October to connect people with their stonecarving heritage, from recording the stories of local stonemasons and photographing the rich variety of carvings around the town, to guided walks and opportunities to try out the art of carving stone. We launched our project at The Stove Cafe on Saturday 6th October with a stonecarving ‘taster session’ and a special exhibition showcasing our work so far and our future plans. Guided tours of the town centre and a programme of talks exploring the region’s stonecarving heritage will be taking place through the autumn and winter featuring the craft of modern sculptors, bagpipe iconography in carved stone and the work of medieval masons in Dumfries and Galloway. 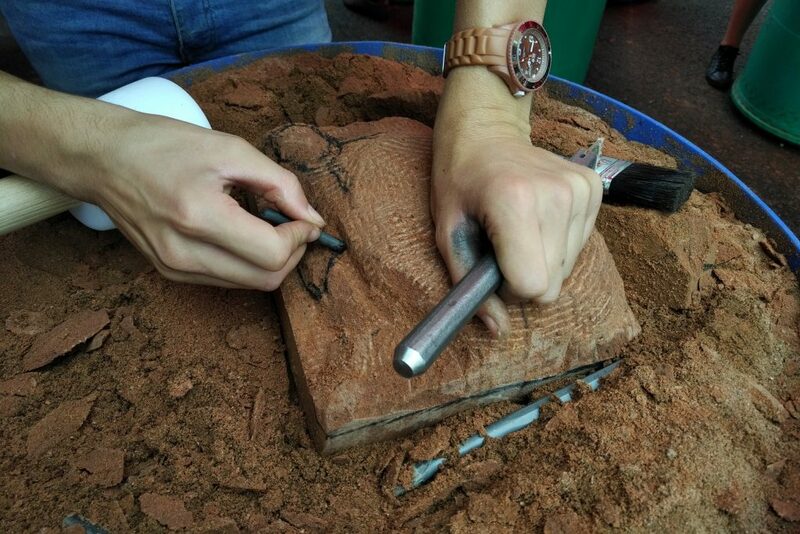 The project will work with a range of partners over the next year; Wikimedia UK will host Edit-A-Thons, during which volunteers will learn how to add information about Dumfries’ stonecarving heritage to Wikipedia. Dumfries Museum will host an exhibition of work produced by the project, and the Dumfries Archive will share their historic records of the stone carving craft. We will be holding a stonecarving school in Dumfries in April 2019, for young people between 15-25 to experience this traditional craft, with tuition from professionals, and workshops exploring the stonecarving of the local area. Places for young people are free, but are limited in number. This will take place on the week of Monday 8th to Friday 12th April 2019. For more information on how to apply contact stonecarving@dumfriestrust.org.uk Priority will be given to those who can attend the whole week. A new carved artwork will be created for the town centre, and smaller stonecarvings by local young people will be installed around Dumfries. 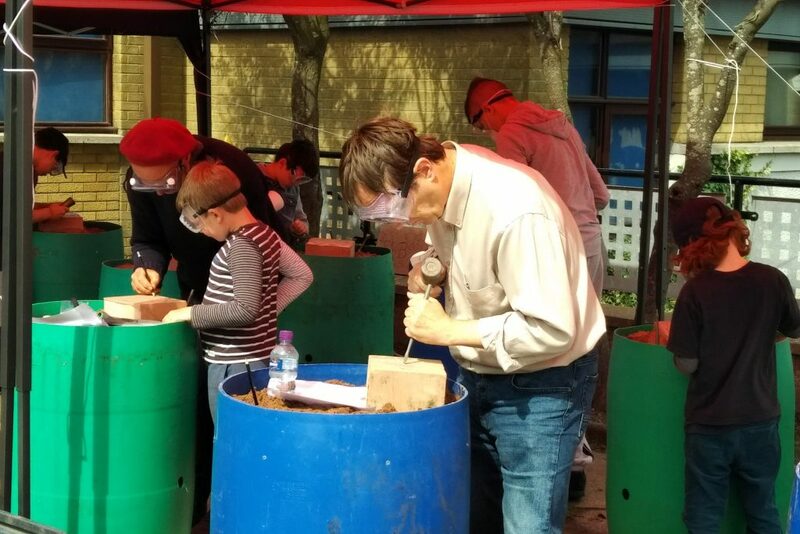 The project has already hosted two successful Stonecarving Summer Schools at Summerhill Community Centre and Lochside Family Centre, where young people learned from expert stonecarvers about this important craft, and went on ‘Stonecarving Quests’ – guided walks which highlighted some of the carvings in the town centre. In collaboration with the Midsteeple Quarter project and other partners, this project will contribute to the revival of Dumfries’ historic centre by celebrating stonecarving as an important element of local heritage and a living craft tradition, which can be re-established as part of a renewed focus on the High Street. The project will work with the blueprint100, a group of young emerging artists, and Dumfries Museum to curate the project’s final exhibition for Spring 2019. Dumfries Historic Buildings Trust aims to advance heritage by preserving and restoring buildings of particular beauty or of historic or architectural significance; and to increase awareness, appreciation, and education relating to the architectural heritage of Dumfries and Galloway. Dumfries Historic Buildings Trust is a Company Limited by Guarantee with Charitable Status Registered in Scotland. Thanks to National Lottery players, we invest money to help people across the UK explore, enjoy and protect the heritage they care about – from the archaeology under our feet to the historic parks and buildings we love, from precious memories and collections to rare wildlife. www.heritagefund.org.uk.